Yup. It’s 2019, and the oceans aren’t going to clean themselves. When God gave man dominion over the earth, we were meant to rule over it with stewardship and wisdom. Not to exploit its resources, or each other. Although we are called to be in this world, but not of this world, I don’t think we’re supposed to be okay with its destruction at the hands of humankind. Before the arrival of the new heavens and the new earth — if God came to redeem us in this world’s present, broken state — surely we must love and treasure creation as He did. Although it’s not eternal, this world, its history, and its future have meaning in His eyes. In third grade, Mrs. Norton taught our class about pollution, litter, and climate change. I was appalled. That day, I held my breath when I went outside; how could I know if the air was clean? Suddenly, I saw the inefficiencies of traffic and the over-consumption of goods in a different way. I felt guilty for flushing the toilet too many times, or for showering longer than necessary. I gasped if I found trash on the floor. I looked around at lunchtime, and noticed the styrofoam trays from the cafeteria line that went in the bin. Why did my classmates bring everything in plastic bags? How come I was made to feel out of place, with my thermos of last night’s leftovers? There were far too many questions for my eight years of experience to answer, and the problems seemed too vast for a small girl like me to fix. It nagged at me for years. Occasionally, reports of overpopulation, extinction, drought, flooding, oil spills, melting ice caps, and other disheartening events would reach me. Surely the scientists and experts were working at it. My dad was one of them, after all. But how could I stop? Consumerism was in our culture, and I could be noticed for wearing the same clothes three days in a row (and I was). Gradually, I adjusted my need: for more shirts, more pants, more gadgets, more stuff. Nobody around me seemed to resist our wastefulness. Meanwhile, I came across Thoreau’s Walden. It opened my eyes to an alternative way of living. By attaining the riches of contentment, and the excellence of nature. A cabin in the woods. Wishful thinking though, right? Actually, these concepts of minimalism, zero-waste living, slow living, etc. aren’t anything new. But they have gained a new relevancy in the context of fast fashion, single use plastics, and other conveniences that society is not ready to give up. I’m thankful that we can champion a better way of living under these banners. These are “trends” that are not going anywhere soon, and they may even save us in the end. These movements have empowered me to believe that my actions today can truly make a difference. Yes, maybe it’s not possible to attain zero-waste overnight, or ever, with this current infrastructure. But if I try, it’s a start. Every time I make a transaction, I’m casting a vote. I decide who makes my food and clothing, and where those resources come from. The impact of our votes are profound. The following section is not sponsored. The opinions expressed are 100% my own. Putting this into action happens by making one switch, one choice, or one (non)-purchase at a time. Say! My old plastic phone case is cracked and broken. That certainly isn’t very sustainable, because I need a replacement now (unfortunately for the planet, it was cheap). Let’s start there. Want to see what phone accessory waste looks like? 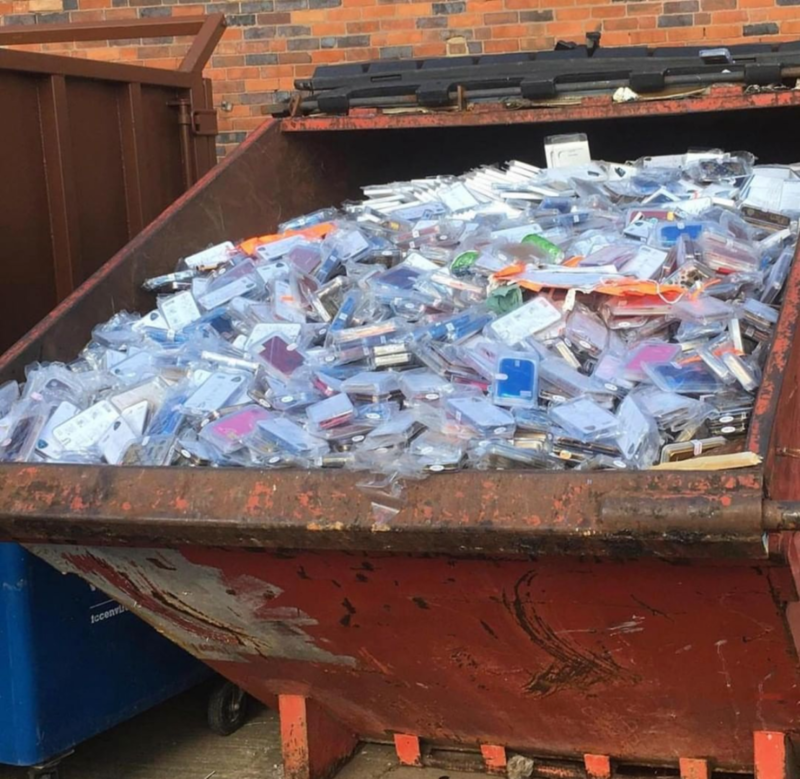 This image shows you what JUST 60,000 plastic phone cases and screen protectors looks like. It fills 1 commercial waste bin. This is from ONE retail store as they turn over their inventory for the new release of phones…every year! How is this ok? Fortunately for our mission, Pela sells the world’s first fully compostable phone case, made from starch-based biopolymers and flax shive, AKA “Flaxstic”! After doing some research, I ordered a classic Pela Case for iPhone 7 in Shark Skin. It arrived after five business days. The cases are BPA, lead, cadmium, and pthalate free, child-safe, and lightweight, and they offer great protection from drops and scratches. The material is durable, protecting the phone while in use, and formulated to only break down in a composting environment. Not all bioplastics are created equal. Most people see the word bio and think “natural” and associate it with safe. Compostable plastic must also disintegrate and become indistinguishable in the compost, and they cannot leave any toxic material behind. These materials are capable of breaking down into carbon dioxide, water, and biomass at the same rate as cellulose. On the other hand, to be labelled a biodegradable plastic, there is no time limit set on when the product breaks down, and these plastics CAN leave behind toxic residue. Another great thing about their company is that they do not mail their products with excessive packaging. It comes with free shipping! There’s a lip that rises a little above the phone screen, which protects it from impact. I appreciate Pela’s smooth, slip-resistant texture, its lightweight design, and how protected my phone feels. There are holes cut out for the camera, speakers, charger plug, and lock button, and the volume buttons are easy to manipulate through the covering. I’m glad I chose the Shark Skin color, because it’s neutral, but a little more exciting than plain Black. I wasn’t too sure about the flecks in the material when I was looking at the photos online, but now that it’s in my hand, I appreciate how they make my case unique. Because the material is flexible, the case probably won’t break easily. Although there is some give, it is still a very substantial and protective material for my phone. I’m learning that I don’t need to sacrifice style or quality to make thoughtful purchases. Overall, I’m very pleased with my first zero-waste product! It’s far more beautiful, beneficial, and protective than my previous plastic case *shudders* — and I am definitely looking to phase out many of my other plastic products in the near future. Being green is cool! Pela also gives every customer a discount referral link for 20% off. If you are interested, I’m linking mine here. Starting with the little things, I joined the #pelafam. And I’m sure there’s more to come. Thank you for coming with me along this journey. Hey Michelle! That’s amazing timing… I’m glad that this post could help at least one person out! ❤ I’m sure you would love an eco-friendly option like Pela. Let me know what you decide! P.S. Really excited to see you around for the next semester at least. Yay!! !